Today I have for you a little review on these lovely Shamballa bracelets*. 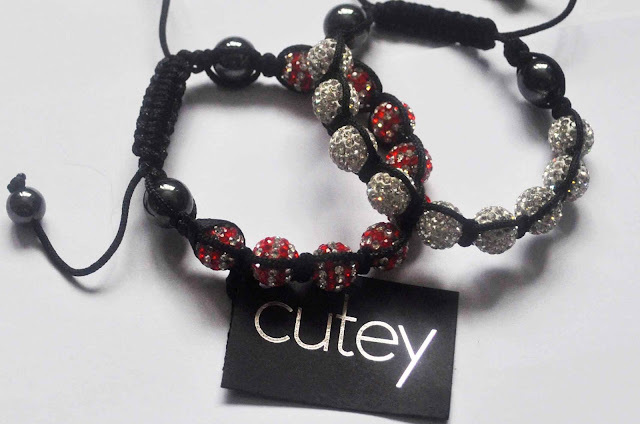 I had been wanting some shamballa bracelets for a while but hadn't had chance to buy any so I was really grateful when Ashley from Cutey contacted me asking if I would like her to send me some. I already own one of Cutey's charm bracelets so I was excited to try out their newer shamballa bracelets too. Ashley picked the colours for me and I love the ones I received, especially the white one; that was my favourite from the website. They come in a few other colours too, such as pink, gold, blue and even multicoloured! They come nicely presented in little plastic bags with a little "Cutey" tag (I'm a sucker for cute branding), and they look and feel very good quality- they are quite weighty and the string used for them isn't too thin, so there is no worry about them breaking. The pictures above do not do these bracelets justice, they are so sparkly in real life and look really pretty layered up with other arm candy. The shamballa bracelets have a draw string fastening, which means they are adjustable. They fit my tiny wrists quite well which is always a plus for me as I am used to bracelets annoyingly sliding off my hand. One thing I noticed is that the fastening is quite stiff so it is quite hard for me to adjust it on my own with one hand, but I am sure that it will loosen up and become easier after a bit of use. 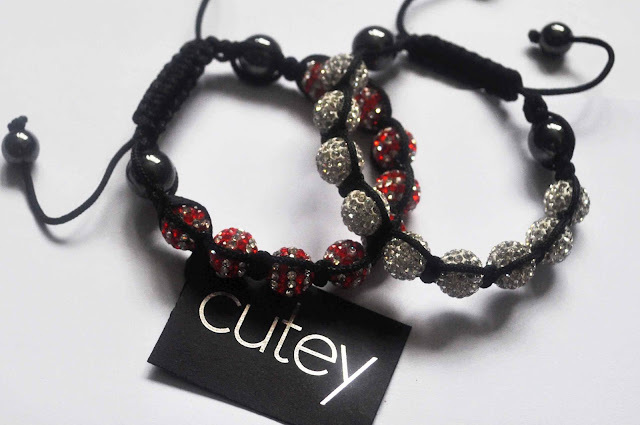 These shamballa bracelets are available here for £18.99 each- a little pricey but I think they are great quality and would make lovely gifts :) Cutey offer worldwide shipping, and shipping is also free within the UK! 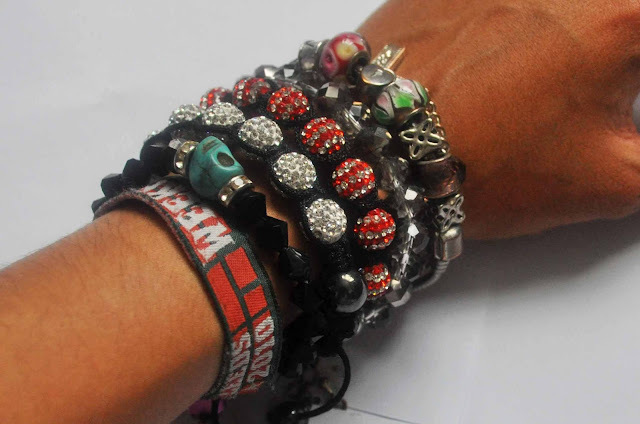 Do you own any Cutey bracelets? I love them to, so cute! These bracelets match with any personalty whether it is man or women and hat is the specialty of these bracelets. So Crazy and Cute! :) love them.